The US Marine Corps is currently developing a new information war blueprint, mainly to allow the Marine Corps Expeditionary Force Information Corps to form combat capabilities as soon as possible, and to provide field commanders with various types of information including networks, intelligence, and electronic warfare. 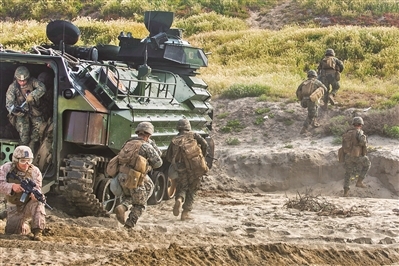 The US Marine Corps formed an expeditionary force information group in July 2017, and then began to participate in various exercises, which is expected to form a full operational capability this year. In several wars of terrorism in recent years, the US Marine Corps is the first-line ground force of the US military. Behind it is a strong support and support system, often under the obvious “I am weak and weak” combat conditions. Currently, the US Marine Corps is returning to the core mission of amphibious operations. Robert Neller pointed out that in the future, the US Marine Corps may be forced to deal with war conflicts without air superiority and global communication and information networks. Therefore, the US military needs to reinvigorate the concept of mobile operations as a way to defeat the enemy. At the same time, information and networks will also play an important role. Driven by the above ideas, the US Marine Corps proposes to integrate, integrate and utilize battlefield information resources including electronic warfare, C4ISR (ie, command, control, communication, computer, intelligence, surveillance and reconnaissance) and network electromagnetic space. In order to achieve the goal of transforming to information warfare, we will start from the multi-disciplinary planning, preparation reform, training exercises and other fields to enhance the information warfare capability of the Marine Corps expeditionary force including intelligence gathering and information processing. The US Marine Corps was reorganized in the first half of 2017 to create a deputy commander responsible for information affairs, primarily to oversee all aspects of information warfare, including networking, electronic warfare, signal intelligence, and information operations. In July 2017, three expeditionary units of the US Marine Corps formed an information group. The Marine Corps Expeditionary Force is a large task force that includes command, ground, air, and logistics forces. The First Expeditionary Force was stationed in the Pendleton Barracks in California. The second expeditionary force at the Norfolk Barracks in Virginia and the third expeditionary force in Okinawa subsequently formed an information mission. The information group was restructured by the former headquarters of the US Marine Corps Expeditionary Forces to support the support mission. The resident remains unchanged. In addition to continuing to shoulder the tasks of command security, infrastructure, logistics, training and administrative support, The scope of the mission has been expanded to provide a series of information-based capabilities for the expeditionary forces to achieve rapid perception of threat environments, electromagnetic spectrum environments, and cyberspace environments, and to improve the information capabilities of the Marine Corps. Colonel Roberta Shay, the former commander of the First Expeditionary Force, said that the post-transformation mission was adjusted to provide information on cybersecurity, electromagnetic spectrum, cyberspace operations and security breaches to the commander of the expeditionary force. Colonel David Owen, commander of the Second Expeditionary Force Information Corp., said that the “additional mission” would better coordinate with the support of the airspace task force in the information field. A headquarters group of the US Marine Corps Expeditionary Force has a total of 1,200 people. The restructured information group will add 150 posts, that is, recruiting members of the Marine Corps with network and electronic warfare experience, and adding one battalion to the establishment. The size of the six battalions is liaison camp, intelligence camp, radio camp, communications camp, law enforcement camp and logistics support camp. According to the schedule, the US Marine Corps Expeditionary Force Information Corps completed the recruitment and full formation of new professionals in FY 2018, and is expected to have full operational capability this year. The US Marine Corps will receive support from the national and military levels in intelligence and information operations during the war, and will also be supported by the information system within the Marine Corps. But these are all rear support, and the Expeditionary Forces Information Corps is directly involved in the Marine Corps operations, extending intelligence and information operations to the front line of the battlefield. Lieutenant General Robert Walsh, commander of the US Marine Corps Combat Development Command, believes that the rapid development of the Internet, wireless communications, and the widespread use of social media have changed the way the enemy uses information and also changed the operations of the US Marine Corps. the way. For example, the Marine Corps Information Corps invaded the target mobile phone on the battlefield, and then the intelligence personnel analyzed the extracted images, and then the electronic warfare personnel tried to use the handheld radio to prevent the enemy’s possible actions. This is one of the tasks of the Expeditionary Force Information Corps, or it will change the future amphibious battlefield situation. In order to speed up the formation of the expeditionary force information team and plan future information operations, the US Marine Corps is developing a new information war blueprint, which is expected to be completed this spring. The blueprint is a conceptual framework document that will be updated regularly to address the policies, standards, hardware and software facilities, technology, capabilities, etc. of the Marine Corps information warfare. A spokesperson for the US Marine Corps said that the current and future information environment is more complex than previous generations. Firepower alone is not enough to achieve operational objectives, and must be combined with information-related operational capabilities to win. The blueprint will refine the composition and capabilities of the Expeditionary Force Information Corps, particularly intelligence, information warfare, and electronic warfare capabilities. The Marine Expeditionary Force Information Corps also conducts drills to test and develop skills and coordinate and integrate with other forces through exercises. In August 2017, the Second Expeditionary Force Information Corps was formed to participate in a multi-country “large-scale exercise 17”. The first exercise provided support for the US Marine Corps in the information environment. From February to March 2018, the information unit held field exercises, which provided support for the combat troops for intelligence, information, and allegations, and improved the ability to integrate with the subordinate units through drills.